When thinking of the above definition we might stop and realize that we might have an issue with our own insulation, maybe a draft is coming in our homes or we aren’t staying cool in the heat. What we might not even think of is the problem could be coming from above, in the attic. We are here to tell you that it is common and we are here to help! Give us a call today so we can help you to save money when it comes to the installation in your attic. We can imagine how many times we have tried to stay warm in the cold months, even keeping our heat at its normal temperature, but then overtime we slowly start to raise it one degree at a time. Our issue could be that we have bad insulation in the attic that needs to be refilled or completely replaced. Everyone knows that heat rises but the issue is when our heat keeps rising until finally it has escaped right outside of the roof. We want to protect our heat from leaving the house and trap it inside where it belongs, which in turn will lower our heating bill. After realizing that there is a bigger issue going on in our home than just a “slight” draft, we know that we have some investigating to do. The more time that we allow to pass = the more money that is slipping away right from the inside of our wallets. The more money we are pouring into the cost of heating and cooling our home the more its drifting away and not being put to good use. We should be putting the extra money into insulating our attics. Pros: It is one of the most affordable types of insulation you can choose. It is easy and quick to install for the professionals although you can apply fiberglass batts yourself. . Relatively inexpensive for attic projects compared to other materials. Cons: Because it is larger sheets of fiberglass it tends to not work as well because it doesn’t fill the cracks and spaces like other insulation. It also can be dangerous to use due to the material that it is made from its small glass particles and may cause skin irritation. Pros: Eco Friendly because it comes from recycled newspapers, it packs tightly into building cavities, inhibiting airflow, great for sealing around any wires, electrical boxes, and hard to reach areas. 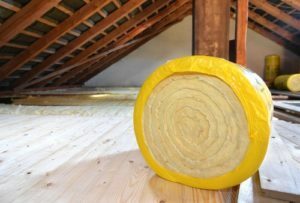 Cons: Cellulose can shift and settle to one side of the attic due to airflow, which can cause an unevenly coated layer of insulation. NOTE: It is not an air seal. Which means cold and hot air can move through the space without any barriers. Pros: Foam is sprayed into wall cavities and expands to fill cracks and holes, creating an air tight seal that minimizes the air to escape. It has the ability to reduce moisture and mold with its sealing capabilities. It keeps the cold and warm air from mixing, and moisture from forming in your home. Cons: Higher priced, and sometimes not necessary to use in certain places. Spray foam is not to be used as a DIY attic project. It must be installed by a professional.